United States, 4th Jan 2017 – Abbkine Scientific unravels another product under the Purification tool Category called Purkine Heparin Resin 6FF which is said to be effective in purifying a variety of heparin-binding proteins. Heparin is an anti-clotting agent found in the human body that can be used for the treatment of thrombosis or blood clots. Some of these proteins include Lipoprotein (proteins that carry lipids in the bloodstream); Anti-thrombin III (non-vitamin, K-dependent protease); and, proteins like transcription factors or virus coat that connect to Deoxyribonucleic Acid (DNA) molecules used in the growth and reproduction of living organisms. This Purkine Heparin Resin 6FF is made up of 90μm beads (polystyrene-based microspheres) chemical bond six percent Agarose (polymer material) linked to Heparin. This facilitates optimization that leads to maximum yield of protein, capability to get dissolved and stability. There is no decline in performance even after five consecutive uses base on tests. The product is available in pre-packed kit formats and spin columns. This packaging is ideal for sample purification as well as preparations. Abbkine Scientific makes use of the most recent procedures designed for synthetics together with advanced techniques in resin development as well as maximization of accessories. 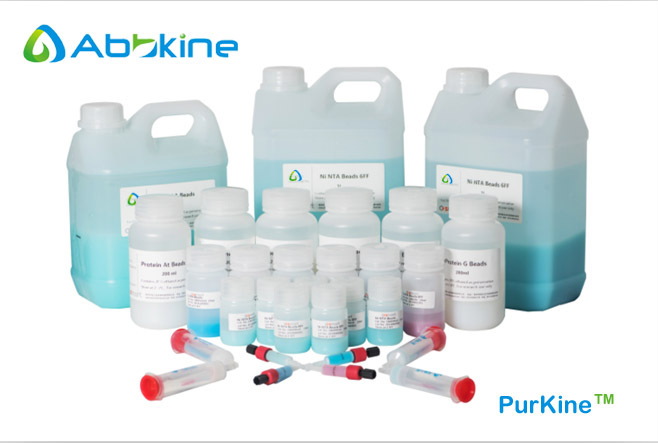 Purkine tools are made available for samples from nucleic acids including DNA and RNA, anti-bodies and bio-molecule markers. The end results are enhanced productivity, shortened workflow and more cost-savings. Purkine Heparin Resin 6FF is formulated using a liquid solution of 50 percent semi-liquid mixture in 20 percent ethanol liquid. It has multiple benefits like density of Ligands (more than 4 milligrams of heparin and resin); high-performance; affordability; and minimal loss of Heparin Ligand and pH stability range from four until 12. High performance also means excellent binding capability and high rate of flow. The cross-linked beads are capable of enduring linear flow rates of up to 400 centimeters per hour. The Heparin can be stored for a maximum of one year at two to eight degrees Celsius from the date of its shipment. However, the product must not be kept in a freezer. This particular product is meant for research purposes only. It should not be used in humans or for any clinical diagnosis. Abbkine Scientific states that applications of their products do not mean recommendations for usage. This can mean violation of patents or licenses. The company will not claim responsibility for patent violations or other breaches that may arise in case the product is used. Abbkine Scientific Company focuses on the development, production and marketing of products for disciplines related to life science. It guarantees premium quality at reasonable costs. The bio-chemicals, anti-bodies, assay kits, and recombinant proteins of Abbkine are employed in practically all scientific environments and applications. These are bio-technology, cell research, diagnosis of diseases, and pharmaceutical development. The company strives constantly to reduce research costs without compromising reliability and values. Moreover, it makes sure that products are accessible from research quantities up to huge volumes for development and production. The company’s exact address is Building 1, Harbor of Technology Times, (#35 Optical Valley Road), Wuhan (Hubei) China 430074. Check out the company’s website at //www.abbkine.com for more information. Abbkine Scientific espouses the principle of Quality First, Customer First and Best Service for all of its clients. Company management also looks forward that all details in this Press Release can help readers in their research work. They are free to give feedback to the company by contacting support@abbkine.com for additional queries.